One of Animax Asia’s lineups for the month of March is Rental Magica. The title alone gives you an idea of what the show is about. Itsuki Iba is the main character of Rental Magica. Itsuki inherits their family business after his father’s mysterious disappearance. Their business serves to dispatch magicians and Itsuki’s near to zero background of magic brings him a lot of problems. Itsuki’s problems with running his family’s business, however, is doubled because of his Glam Eye. Often covered with an eyepatch, Itsuki’s Glam Eye gives him extraordinary abilities such as seeing magic and distinguishes it, whether its weak or strong. But once uncovered, the Glam Eye gives Itsuki so much pain from lack of practice and it also changes Itsuki’s personality as well; Itsuki’s kind personality gets replaced with a domineering and cocky characteristic that is not normal, even for Itsuki’s standards. And don’t forget to throw in the employees and people who threaten his business to his list of problems. Although it may not be an anime fresh from the production studios, Rental Magica still draws fans both new and old to its unique story. 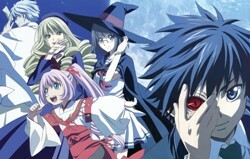 Rental Magica premieres on Animax on March 29, 2012 at 11:00 PM. It will be aired regularly from Monday to Friday following its debut on Animax. For more schedules on Rental Magica, please visit the official Animax Asia website.